What is Brand Equity and What Does the Branding Concept Mean? Brand equity is a term most of us are familiar with and probably even use from time to time. But, as with many business concepts we may have a less than perfect understanding of what the term really means. This limits our ability to effectively develop marketing plans to create the kind of brand we want to project. So, exactly what is brand equity? What does it mean to create an effective brand? Why does any of this matter to an individual agent? Brand Equity - What is it? Brand equity is the value of the brand in the marketplace.1 Simply put, a high equity brand has high value in the marketplace. However, what this means exactly is often not fully or clearly understood. But, how is this overall positive response created? What creates this positive response? So if brand equity is simply the value of the brand in the marketplace and this value is the positive differential response to the brand, what is it that creates this response? The answer to this question lies in understanding the source of the brand's value. 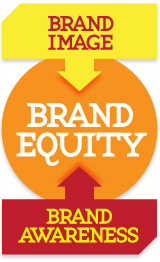 Essentially, where does brand equity reside? An interesting question to ask anyone with a decent understanding of business and financial statements would be "Where on the financial statements is brand equity listed?" The answers you would hear would vary from "in retained earnings" to "it's listed as goodwill" or "I'm not really sure." Obviously, brand equity is an intangible asset, meaning that it is something that is not easily accounted for. And, in fact, it is not listed on any specific line in a firm's financial statements. It is reflected in earnings and in stock price. But, where is this value held? The answer is that brand equity ultimately resides in the mind of the consumer.3 A brand is essentially a perceptual entity and this is the reason it cannot be accounted for in a financial statement. The value of the brand is essentially made up of two dimensions: 1) brand awareness and 2) brand image. These two dimensions represent: 1) How well known is your brand? and 2) What does your brand represent? When your brand is well known, has high brand awareness, it is easily recognized in the marketplace and easily recalled when faced with a brand-related need. A high level of awareness with your target market is a necessary dimension for a strong brand. Well-known brands must also carefully manage what it is they represent: their image. Given that a brand is a perceptual entity, it is not surprising that when we think of brand image we use psychology to understand this concept. The brand's image, what is known about the brand, is information and associations with the brand stored in your memory. When you see an ad or a yard sign, recognition of the brand leads to the retrieval of these associations from memory. You create these associations in everything you do - advertising messages, logos, names used, segments served, etc. If you use a statement in your advertising that you are the "Team to Trust" - you hope that "trust " will become a brand association. If you serve a specific segment, then that segment is likely to become associated with your brand. Everything you do in terms of marketing and actions creates brand associations. Traditionally, your branding elements are the most noticeable features associated with the brand itself - the brand name, slogans, logo, and symbols or pictures used on product offerings and contained in any marketing messages. But, it is important to know that branding elements extend to the content of the marketing message itself and even your positioning within the marketplace. Every aspect of these elements creates your brand image. It is important that this image is relevant to your customer, clear in what it stands for, and offers some point of differentiation from your competition. A Relevant, Clear, and Unique Brand Image - This is what you want! A brand image is strongest when it is highly relevant to your customer. Relevance is determined by what customers want as they choose their realtor. It may be aggressive marketing, it may be a solid reputation, or it may be a certain type of expertise. Market research and understanding your strengths and the needs of the segment you find most attractive will help you to determine what type of brand image and specific associations you want to create. Finally, your brand is by definition a way to identify your offering as unique from others in the marketplace. Branding has been used for centuries. The term itself is derived from the Old Norse word brandr, which means "to burn" as branding was and is still used to mark the ownership of livestock. Today branding is used with a variety of products, services, people, places, ideas, and concepts with the same purpose in mind - to distinguish each offering from the other. So, choose your branding elements so that they set you apart. That means unique signage, logos, slogans, marketing messages, and team names. All of these branding elements can set you apart as unique. But, be careful that they are also relevant and clear. Brand Equity - How well and what is known about your brand! Ultimately, brand equity = consumer brand knowledge. You create your brand's equity as you create your market's consumer knowledge. Recall that brand equity is the value of the brand in the marketplace. We should think of brand equity as an asset that we will receive returns on today, tomorrow, and the days to come. As with any asset, you have to decide how best to invest in it. Invest wisely and you will have the type of brand equity that provides good returns. Build a brand that is high in awareness. Grow a brand that is readily recognized whenever and wherever it is seen. When consumers think of needing a realtor, your brand should be the first one that comes to mind. Such a brand leads customers to easily construct an image of your brand that is relevant to their needs, clear in what it stands for, and stands out from your competition. When you have accomplished this then you have made the right investments in building your own brand value - high brand equity that won't appear on a financial statement on its own unique line, but will be reflected in the top-line revenue and the bottom-line profitability. 1 Keller, Kevin Lane. 2003. Strategic Brand Management: Building, Measuring, and Managing Brand Equity, 2nd Edition. Upper Saddle River, New Jersey: Prentice Hall. 2 Netemeyer, R.G., Chris Pullig; B. Krishnan; D. Dean; J. Ricks; G. Wang; F. Wirth; and M. Yagci (2004), "Developing and Validating Measures of Facets of Consumer-Based Brand Equity", Journal of Business Research, Vol. 57 (1), 209-224. 3 Bettman, James R. (1979). Memory Factors in Consumer Choice: A Review. Journal of Marketing, 43(2), 37. 4 Tülin Erdem, Joffre Swait (2004). Brand Credibility, Brand Consideration, and Choice. Journal of Consumer Research, 31(1), 191-198. 5 Pullig, Chris; Carolyn Simmons; and Richard G. Netemeyer (2006), "Brand Dilution: When Do New Brands Hurt Existing Brands?" Journal of Marketing, Vol. 69(2), 130-142. 6 Johnson, Michael D. and Claes Fornell (1987). The Nature and Methodological Implications of the Cognitive Representation of Products. Journal of Consumer Research (1986-1998), 14(2), 214.